The exciting young professional orchestra, Cardiff Sinfonietta has announced a 2017/18 Season not to be missed, filled with a wide range of concerts with internationally acclaimed soloists. 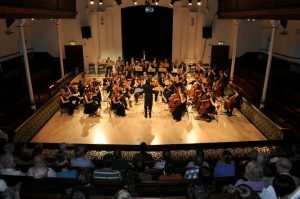 Under Artistic Director Jonathan Mann, Cardiff Sinfonietta prides itself on providing opportunities for young professional musicians throughout Wales and the UK a chance to play mainstream orchestral repertoire with world class soloists. The coming season is the orchestra’s most ambitious year yet, with concerts ranging from the Welsh debut of Cardiff based composer, Bernard Kane’s, Euphonium Concerto, to a concert featuring the world-renowned percussionist, Dame Evelyn Glennie. The orchestra will begin their concert series on Saturday 30 September, with a special concert in memory of the local violin teacher Harry Cawood. The concert will feature acclaimed soloists, Rhys Watkins, Charlie Lovell Jones and Rakhi Singh, some of whom studied with Harry. Other concerts this year will include an American Night, with international Euphonium soloist, David Childs; a Cello Extravaganza, with celebrated cellists Rowena Calvert, Leonard Elschenbroich and young Welsh cellist Steffan Morris; Liverpool Lullabies with the famous percussionist Dame Evelyn Glennie; a Piano Marathon, where Italian pianist, Emilio Aversano, will play three piano concertos in one concert; and to finish the season An Evening of Welsh Song with soprano Elin Manahan Thomas. All performances in the 2017/18 season will take place at the Dora Stoutzker Hall, at the Royal Welsh College of Music and Drama. Tickets start at £13.50 and can be purchased from the RWCMD Box Office by calling 029 2039 1391 or by visiting www.rwcmd.ac.uk/whatson.